E-Blocks	are plug and play modules that allow quick and easy construction of electronic systems. A complex system can be constructed without the need for a soldering iron. Thus more time is available for system design and software application development. 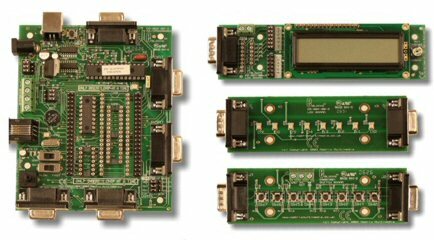 The PICmicro MCU Multiprogrammer can either be used as a stand alone PIC programmer, or as the heart of an E-Block system. Code is downloaded rapidly to the target processor using a USB connection. The Multiprogrammer has a series of 9 way D connectors that bring the the target device I/O ports to the outside world, allowing other E-Block modules to be connected. E-Block connect to each other using standard 9 way D connectors. E-Blocks can be used to rapidly prototype systems without the need for a soldering iron. It can also be economically for the E-Block hardware to be used in the final product of a development (when used in low volume production).